Last year, I remember the last outing. It was extremely hot and I only caught one fish. It was a day of attrition as I bounced from one spot to the next with my girlfriend in tow. It was an exercise of futility as I couldn't figure out why the river wasn't giving up any fish. One clue was another angler tossing spinners and landing a smallmouth bass. Even though it wasn't the end of April, it felt like most of the fish did their thing and immediately raced back to the lake. There wasn't any stragglers or last minute spawners. I just remember sitting at the restaurant eating wings, watching the Cavs playoff game, and wondering why I had only one fish. My girlfriend on the other was happy that she started on her tan early. What's special about the last outing is you never know how the day will start or end. Some years, I've banged fish in every spot and other years, I've struggled and threw in the towel by mid morning. The weather was also unpredictable. It was either fishing in a tee shirt or bundling up. There was no in between, because the weather during the spring on the Alley can be so fickled. I'm sitting my car, drinking my coffee as I wait for the gatekeeper. One of my friends has the access code for the gate. The weather today is not one expects for April 30th as the temperatures are lucky to make it out of the 30s. April has been a miserable month for most Clevelanders as the winter begrudgingly hangs on and many have grown weary of the cold and dreary conditions. The gatekeeper finally arrives and opens the gate. We drive down the road and park on the gravel bar right next to the river. The wind is blowing from the north and the skies are low and grey. In past years, the trees and bushes would be sprouting leaves. Today, the surrounding landscape is lifeless. There's four of us and we spread out, wondering who will be the first to hook up. Usually I'm the first because I have a good idea where the fish are. I immediately go to my money spot above the pool. Fish will be either dropping back or spawning. This time of the year, fish will be passing one another. Some have spawned weeks ago and others are recent arrivals. My money spot as it turns out doesn't give up any fish. Three other guys are clustered at the top of the pool. I chuckle because they are set in their ways. The loveable hole beaters who are content at fishing in one place. They are older than me and father time has taken hold of them. Bad knees and bad habits have render them to fishing in places that have easy access. I on the other hand is in better shape than I was in my 20s. If I was alone today, I would have been far off somewhere, miles ahead everyone. The guys today are only fishing until noon and I'll fish until I run out of bait or patience. The first fish of the morning is caught and I'm downstream shuffling along. I hear whooping and hollering as I start to make my way back up. I suspect the fish are spawning at the head of the pool. Not the one to low hole, I give the others space, plus one of them hasn't been out all season long due to knee replacement surgery. I watch my float chug along and see it go down. I rip it and feel something small tugging. It offers no resistance and I immediately know what it is, a smolt. I fling it out of the water and others see it. I've been know as the smolt master as I have an uncanny habit of cleaning them out of spots. I gently release it and in 10 minutes I catch three more. What is more amusing is the little grebe hanging around in the hopes that he can at least muster the chance of catching one of them. 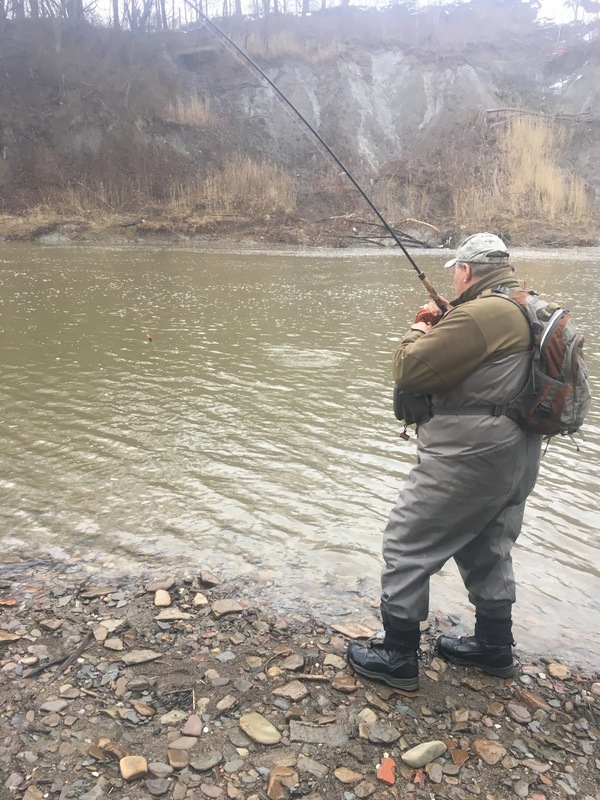 The current is probably a little too fast for him as even the mergansers are on the other side where the current isn't strong in the hopes that can feast on the bounty of them. The others continue to hook into fish and I'm still plugging away. Finally I get redemption as the float gets sucked under and I feel the rod surge. I watch a pretty large steelhead leap from the water. It blasts downstream and scares off the little grebe. With a pretty stout tippet, I haul in the fish quickly. I look down and it's a dropback hen. She has all of the signs as the bottom of her caudal fin is worn down, numerous scars on her bottom and she's looks emaciated. I pop the hook out and she bolts back into the current. We all start hooking into fish, but it goes from hot to cold during the morning. The cold wind starts to take toll on some of us and couple of the guys seek refuge in the truck. I'm chattering a bit as I'm up to five fish caught. I start to shuffle back downstream and cast out under a tree. Mending is a chore because the current grabs my line. 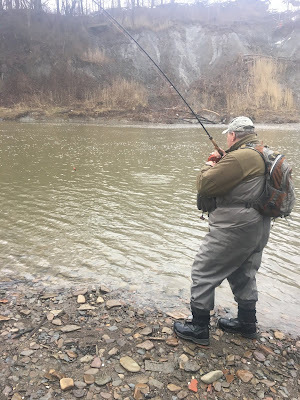 I hold the rod high and flip the line upstream. I continue to watch it go under the tree and float pops and goes under. This fish however feels different. 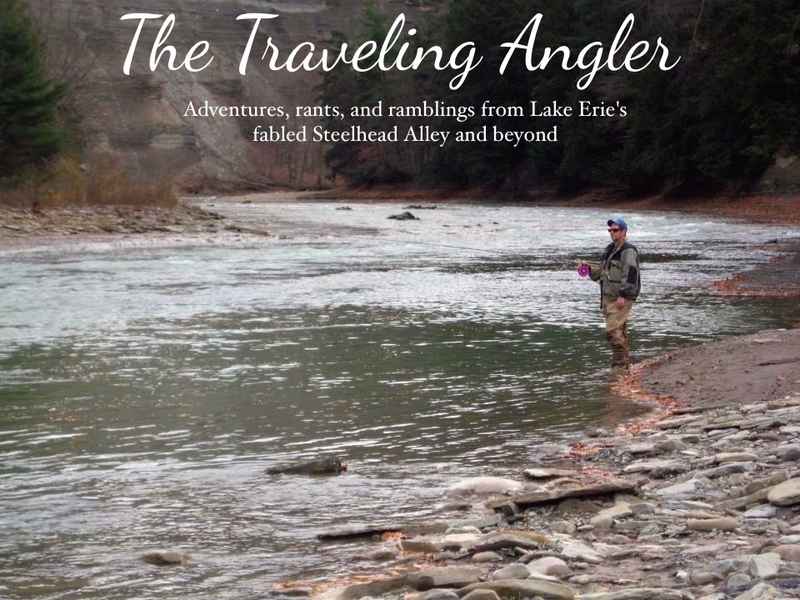 It's not the typical blast off and erratic run of the steelhead. This is more deliberate fight as the fish bulldogs along the bottom. I catch a glimpse and chuckle as I a chunky smallmouth come up. This is another sign that the steelhead run is coming to an end when lake run smallmouth enter the river. Once in a while I'll catch a bass on a spawn sac. Finally the others tell me they're done. Those old bones can only take so much. I'm itching to move to another spot. We head up the road and go in different directions. I'm heading upstream to place that I know that have some fish. I drive down to the recreation center and I pass a series of baseball and soccer fields. The place is empty of people. By the time I get there, the sun is gradually coming out. I see another angler at the head of the pool swinging streamers. I climb down the bank and fish along the cliffs. The clouds are gone now and the sun helps me see the bottom. I gradually inch my way out out on to the shale. I scan the bottom to see where the shale ledge begins. I would have preferred to fish from the other side as I can work it more effectively as the current isn't as strong. The wind shifts to the south and starts gusting. This makes fishing difficult as the wind blows the line off the water. I also have to put the brakes on the float as it drifts pretty quickly downstream. Further up is a place where fish have spawned. I suspect some fish have dropped back into this spot. I work the pool mending the best I can. As the float moves along I watch it go under. I set the hook and the fish blows upstream and leaps from the water. It frantically races along the pool as I put the brakes on it. Being mineful of the cliff behind I try to move the fish along the bank. It's a large spawned out female, probably finished several days by the looks of some fresh scars. I continue to fish and start getting into fish. I look at the bait situation and I'm down to 6 sacs. I had plenty of eggs in the freezer but I purposely keep a couple pounds to fish in the early fall as I can't get salmon eggs until mid October. I catch a couple more fish and I'm down to one pink sac. I look at the river and I toss it in as some token to the fishing gods for a great last trip. It's a very short walk back to the car and I get undressed. I look at my boots and they're a wreck. Last week I had to use super glue as one of the sole came off. I can't complain as I squeezed four years of hard fishing out of them. As I drive home, I call the guys and tell them I hit them good out that spot. For some of those guys, the walleyes will be calling. They'll be out on the big pond all summer long. As for me, I'll be bound to the land. Summer is my busiest time for work. We rarely contact one another during that time as we do our things. It's been like that for the longest time. When the cool winds come off Lake Erie and days get shorter, we reunite.